#Tiger_Shroff says his father Jackie Shroff's journey from a Mumbai chawl to superstardom not just inspires him but also teaches him how to stay grounded. However, he says he can never be as "bindass" as his dad. "He (Jackie) has been taking care of me ever since I was a child. He has sheltered me and given me such a happy childhood. I know the background that he came from. My father used to stay in a chawl in the Teen Batti area... And (seeing)... where he has come to... that inspires me to work hard and do amazing things for my family," Tiger told over phone from Mumbai. So, does he take any professional advice from his father, who has been in the industry since 1982? "No, I don't consult him on my career because his style and my style of working are very different. He does everything in a very 'bindass' way and I can't be that 'bindass'." Tiger, who joined hands with a flagship corporate social responsibility programme P&G Shiksha for a "Shiksha Superheroes" campaign last week, also said that his father's struggle brings a sense of reality in his life. "I look at my father and how in all these years he hasn't changed. So what gives me the right to (fly above the ground). And I also feel that I haven't achieved anything to sort of fly above the ground... Not that I will (fly above the ground ever)." Jackie made his first credited screen appearance in 1982 with "Swami Dada", and went on to give hits like "Hero", "Karma", "Ram Lakhan", "Parinda", "Rangeela", "Agni Sakshi" and "Devdas". Lately, he has featured in movies like "Brothers", "Sarkar 3", "Happy New Year" and "Dhoom 3", among others. Tiger had a successful debut in 2014 with "Heropanti", for which he invested two years of labour and passion to achieve an enviable body frame and a natural fluidity in action scenes. He followed it up with another hit, "Baaghi". Tiger's first setback came with the failure of "A Flying Jatt" last year. 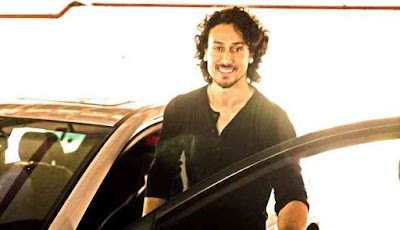 With a Hindi remake of Hollywood action film "Rambo", "Munna Michael", "Student of the Year 2" and "Baaghi 2" in his kitty, the road ahead seems to be all planned out for Tiger. Talking about Hollywood remakes in India, Tiger said: "I think the trend is great. Hollywood films are fantastic. There are so many films that I watch over and over again, so why not make a film again. We might not be able to make it exactly like them most of the time, but at least (we can) take the essence of the story and Indianise it a little bit." Instead of fretting about expectations, Tiger sees his anticipated projects as adding "good pressure" to excel. "There is pressure, but it is a good pressure -- something that makes you want to work harder. It motivates me to do better and better and keep giving the audiences more," added the 27-year-old.